Edinburgh councillors have voted 36 to 26 to go ahead with the extension of Edinburgh Trams from the city centre to Newhaven via Leith Walk at a cost of up to £207 million. 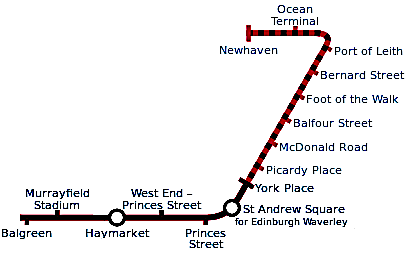 Edinburgh Trams are timetabled to take their first passengers to and from Newhaven in early 2023. Nearly 16 million people are forecast to use the completed Edinburgh Airport to Newhaven tramline in its first year of operation — almost double the number predicted for the existing Airport to York Place route in the same period. Councillor Lesley Macinnes, Transport and Environment Convener, said: “This is a crucial decision for Edinburgh — for today’s residents and for generations to come. “Taking trams to Newhaven will allow brownfield development sites to be transformed, opening up the whole of north Edinburgh to a wealth of opportunities in terms of jobs, housing and local facilities. “And vitally, this will be achieved without putting pressure on existing council budgets. “Our city is growing faster than anywhere else in Scotland — a sign of our continued attractiveness as a place to work, live, visit and spend time — and boosting our public transport infrastructure in a sustainable way is fundamental to catering to our expanding population. Councillor Karen Doran, Vice Transport and Environment Convener, said: “Connecting the people of Leith, Newhaven and north Edinburgh to major employment and leisure hubs through trams will boost the area enormously – socially, as well as economically. “And for our city’s top employers, giving them a safe, reliable, accessible and mass transit public transport link into one of Scotland’s most densely populated areas has got to be a winner, hugely expanding their recruitment pool.